The Fourteenth Amendment was adopted in 1868, and dealt with citizenship and equal rights. 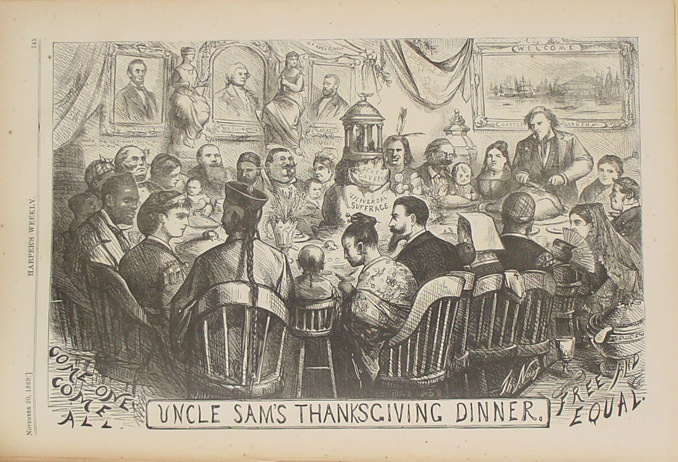 Thomas Nash drew a variety of immigrants -"Come one come all" - joining Uncle Sam [carving the turkey] and Columbia [sitting at the other end of the table] in this sketch "Uncle Sam's Thanksgiving Dinner" published in Harper's Weekly on November 20, 1869. Previous posts for Thanksgiving involved two cookbook authors. Sarah Hale's work to make Thanksgiving a national holiday resulted in Abraham Lincoln signing an official decree in 1863. Lydia Child wrote many cookbooks, books and "Over the river, and through the wood" which is taken from her poem "The New-England Boy's Song about Thanksgiving Day." The first section of the 14th Amendment stated: "All persons born or naturalized in the United States, and subject to the jurisdiction thereof, are citizens of the United States and of the state wherein they reside. No state shall make or enforce any law which shall abridge the privileges or immunities of citizens of the United States; nor shall any state deprive any person of life, liberty, or property, without due process of law; nor deny to any person within its jurisdiction the equal protection of the laws."